81N, 145E. It has now been two weeks since the expedition PS115/2 started. What have the ArcTrain students been doing so far? 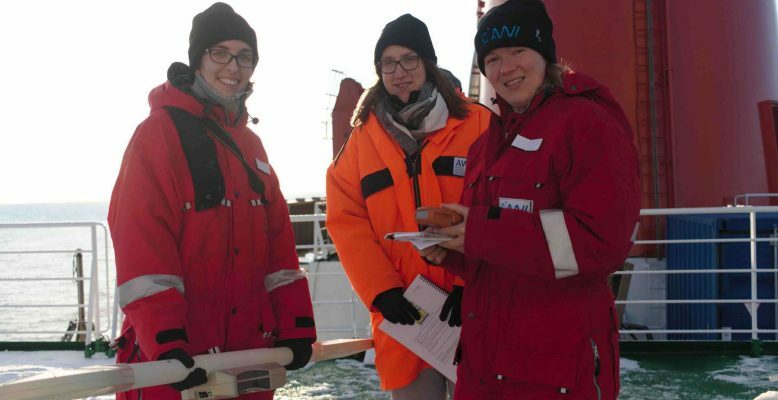 Apart from just being excited about being in the middle of the Arctic Ocean on the icebreaker Polarstern and taking loads of pictures – we split into small groups based on our interests, and assist the different scientific teams. Some of us help the marine geology team take samples from sediment cores brought back from the bottom of the ocean, some others help to prepare instruments that will measure properties of sea ice, yet some others assist on the deployment of radiosondes (weather balloons) for monitoring the properties of the atmospheric column along the ship track. 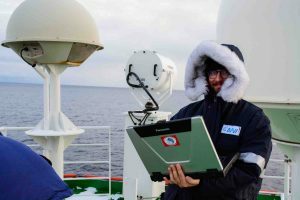 In parallel to these tasks, the 13 ArcTrain students are also an ideal work force for the upkeep of the different monitoring programs that run 24/7 on the ship. We are in charge of the Ice Watch, an international project that consists of a database of shipborne observations of sea ice from vessels travelling into polar oceans. Every hour, one of us goes to the Bridge (where the navigation operations take place) to have an optimal view of the water and ice surrounding the ship within 1 nautical mile. We record some basic information about the ship course (position, speed, direction), about weather (fog, rain, snow, clouds), about fauna if any, and most importantly we provide estimates of the sea ice cover: concentration, thickness, snow cover, topography, melt, and presence of algae or sediments. We plan to compare our Ice Watch reports to remote sensing data to see how closely they match (or not)! In addition, we take turns for the Parasound watch, a responsibility shared with other students taking part in the expedition. The Atlas Parasound is an echosounder instrument that we use for retrieving profiles of the sub-bottom ocean. In other words, it uses high-frequency sound pulses that bounce back from the ocean floor and inform us about the structure of the uppermost sediment layers of the seafloor – an echography of the ocean! During watchkeeping, we make sure that the instrument is correctly tracking the ocean depth, we fine-tune the amplification of the signal, and we ensure that the profiles display and print properly. All that in real time so that nice sub-bottom ocean profiles are ready to be used for operations: the profiles can help the geologists decide on where to take sediment cores, and also guide the scientific team on what areas are interesting for further exploration! Finally, we are also in charge of the marine mammal watch, in coordination with the geophysics team. Seismic reflection surveys are useful in retrieving the structure of sediments at the bottom of the ocean, but they require the use of air pulsers that emit a sound recognized by marine mammals. Whenever the seismic survey is going on, to avoid perturbing the fauna, we stand at the Bridge and report any mammal sighting to the geophysics team, so they can stop the measurements. All in all, we’re quite busy, and more work is coming as we reach a new work station tomorrow! Have you ever been in the belly of a giant whale? Lots of love for Jolien van der Krogt ❤️, she’s part of the AWI science group!